When your cat is purring, it seems like the picture of contentment. Perhaps she is on your lap or beside you on the couch while you read or watch TV. There is a lot more to purring than you might imagine. Experts have come up with theories through the years. Most researchers believe that purring begins in the brain of the cat, which sends messages to the cat’s laryngeal muscles. They twitch at a specific rate, causing the feline vibrato – purring. Purrs are often so low-pitched that they are felt and heard. Some wild big cats purr, too, butthe ones that purr cannot roar. Conversely, cats who roar can’t purr.The structures of the larynxes are different in these species. The big cats roar because they move a lot to catch prey, and roaring maintains their territory. We always think of purring as a sign that our cats are pleased and contented, especially with us. In actuality, cats sometimes purr when threatened or frightened, too. 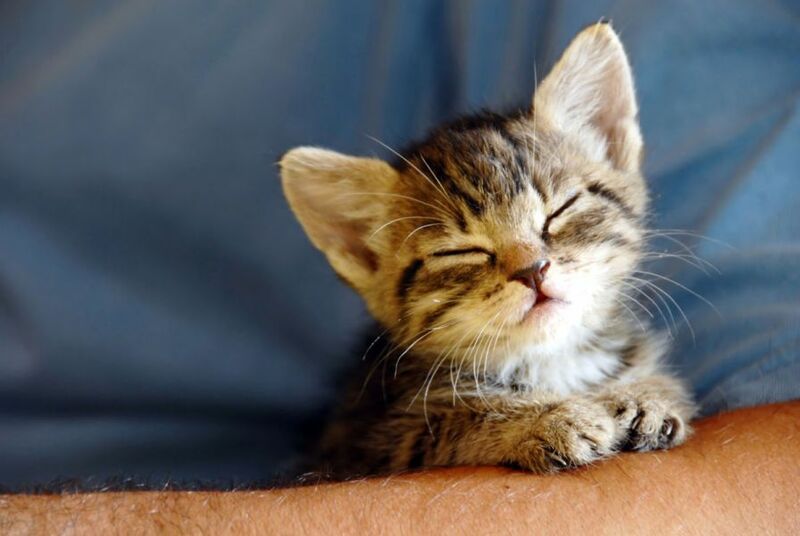 Nerves play a role in human smiling and cats purring. People smile when we are nervous, and cats purr. It can mean appeasement, but it can also indicate contentment, when you can tell your cat is happy. The solicitous purr is more often heard in quiet households, where a cat has a personal relationship with a human. In this case, the pet owner will not overlook the purr. Even non-cat people perceive this purr as more urgent than a contended purr. Researchers suggest that cats might have learned a way to tap into our mammalian response for the nurturing of our offspring, and embed that cry within their purr. Cats purr for many reasons other than contentment. When they are in labor or in pain, they often purr. Some cats even purr when they are close to death. Kittens purr shortly after they are born. Is there some survival advantage to purring? Some researchers in the study of duration, loudness, pitch and frequency in animal sounds believe, after pulling different research paths together, that purring may aid healing. Some feel that the frequency of the purr may offer its own physical therapy. It certainly is no accident when the same frequency is used to help human wounds to heal faster. Cats are the number one pet in Canada, according to wikipet. Canada has about six million dogs and about eight million cats. This may be because cats work so well at reducing your levels of stress and your blood pressure. Purring adds to their soothing effect on the human psyche. Purring is auditory, attributed by humans to calmness and peacefulness. Whether we are right or wrong, we construe it as a positive event. This helps humans to relax when they are in the company of their cats. That is a wonderful reward for just a stroke of your feline’s fur.